Why would a busy professional with lots of experience want to help someone at the start of their career? Well, it feels good to help others who want to succeed. Here’s a real life example of mentoring at the highest level. grumpily ignore them and hope they failed? or support them to the hilt, and pass on all your knowledge and good will? 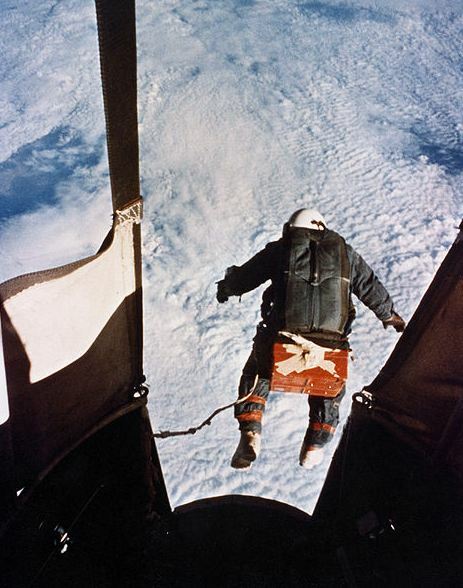 If you’re Joe Kittinger, record holder for the highest freefall jump from the edge of space, it’s a no-brainer – you sign up as a mentor to the person with the best chance of breaking your record, Felix Baumgartner. Mentors want you to succeed, they’re part of your support team. A good mentor won’t tell you what to do, but they will ask you questions to get you to think about the right things, and if you’re lucky, they’ll give you honest feedback so you can learn from their experience. This is our award-winning “de-luxe” option, where you get matched one-to-one with a mentor in an appropriate career area. The programme lasts for 9 months and lets you ask questions over ~ a 6 month period. Meetings can take place face-to-face, over the phone/Skype or by e-mail. It’s competitive, so you need to think seriously about what you want from a mentor, and where you hope your career is heading. Any of our students can apply for our general Manchester Gold programme. We also have mentors who have indicated that they’d be particularly interested in passing on their expertise under one of our specialist strands – disabled students; black and minority ethnic students; LGBT students; international students planning to return home (to China, India, Malaysia or Nigeria); PhD students (this is a new programme which will launch for the Spring programme only). There are two rounds of mentor matching, one in Autumn and one in Spring. The Autumn round has just opened, and closes on Wednesday 24th October, at 5pm. Don’t miss out! You need to apply through CareersLink and all the instructions are now online on the Careers Service website. NB: There will be a list of mentors available very shortly (just being finalised), but the current list on the website refers to mentors from last year. However, it gives you an idea of the wide range of areas we will be able to cover. This new service launched last year and is ideal for specific questions you want answered, without setting up a one-to-one mentoring relationship. We have around 400 online mentors who have volunteered to answer questions by email, through the CareersLink system. Around half of these also have postgraduate qualifications, so they’re ideal for those “postgrad specific” questions. You can only send two email requests per month, so use them wisely. Also, if mentors have had lots of requests, or are unavailable for a period of time (eg on hols! ), the system will let you see their details, but you won’t see any button at the top of their profile saying “Contact mentor”. In that case, you can either try and find another suitable mentor or try again later in the month. Online Q&A is open all year round. Full details of the service are on the Careers Service website. Lots of people, particularly in academia, find their own informal mentors. A recent Guardian article gave some hints on what you can get out of a professional mentoring relationship and how to find one. We’ve also got some suggestions on seeking advice and support for aspiring academics on our website, An Academic Career.